1 Hello, kids, I'm Freddy. I am a firefly, and I'm here to tell you something important. I'm running for president of the Bug Appreciation Club. You probably already know me. You might know me by a different name. I'm also called a lightning bug. And if you've seen me outside, you know that I am simply the coolest, most interesting bug out there. That's why I'd make a great president. 2 When I was born, I hatched out of an egg laid underground. As a baby, I was a tiny larva living in the dirt. Even when I was little, I already had my special talent. I can make light! As a baby, I was also called a glowworm. My light wasn't very bright, but it was enough to get noticed. I spent the summer after I was born eating smaller insects. I sometimes ate slugs and snails, too. When the winter came, I dug tunnels and lived underground. 3 Then came spring, and boy, was I ready! 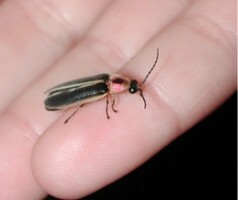 I came out of the ground to eat a little more and turn into what you see now, a fully-grown firefly! By this time, my talent of creating light had grown, too.